A Summer Afternoon: Newport, Rhode Island, watercolor on paper, 34.5" x 24.5" (image), 48" x 38" with frame, s.l.r. William Trost Richards was born in Philadelphia and left school at age 13 in order to support his family, working as a designer of light fixtures. He studied privately with both German-born Paul Weber and with William Stanley Haseltine and first exhibited in 1852 at the Pennsylvania Academy. He also found inspiration in the atmospheric treatments of Frederic Church and John Kensett. The artist first went abroad in 1855 and again in 1866, studying and painting in France, Italy, Germany (Dusseldorf) and England. Great Britain, in particular, held a life-long attraction to Richards. He had many extended stays there throughout his life, made possible in part by the patronage of his friend, Asa Whitney, and he lived there from 1878 to 1880. In 1863 the artist joined the newly founded Association for the Advancement of Truth in Art, an organization dedicated to the ideals of naturalistic representation espoused by John Ruskin. In 1871 he was elected full Academician at the National Academy of Design. Although a superb landscapist, Richards moved progressively toward marine subjects in his later career. 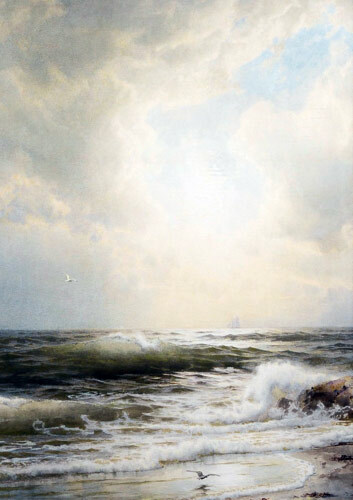 He first visited Newport, Rhode Island in 1874 and became enthralled with the attempt to paint the sea as it actually looked. In 1881, he began construction of his sea-side home, "Greycliff," near Newport, where he remained throughout his life, sharing his time with his farm in Chester County, Pennsylvania. Richards began working in watercolor in the late 1860's, at a time when the medium was just beginning to claim an importance equal to that of oil. Apparently his interest in watercolor corresponded to his growing interest in marine subjects, as the medium allowed a highly atmospheric treatment and was more convenient for plein air work. Richards joined the American Watercolor Society in 1874. He is regarded today among America's finest painters in the watercolor medium. Work by William Trost Richards can be found in most of the nation's fine museums, including the Whitney Museum of American Art, the Smithsonian American Art Museum, the Corcoran Gallery, the Butler Institute, the Pennsylvania Academy of Fine Arts, the Fogg Museum (Harvard), the Museum of Fine Arts, Boston, the Brooklyn Museum, the Art Institute of Chicago, the Dallas Museum of Art, the Wadsworth Athenaeum, the National Gallery of Art, and the Munson-Williams-Proctor Arts Institute.